Sure your new diving or snorkelling mask looks fine to put on and get into the water, but that just won't work out well. You need to properly prepare the dive mask first by thoroughly cleaning it. During the manufacturing process, a thin film of silicone and mould release agents will develop on the glass lens of your new dive mask. This film will cause rapid fogging that is resistant to conventional anti-fog measures. It is important to remove this film from the lens prior to your first dive. To remove the film you will need to scrub the mask lens and skirt inside and out with a powerful surfactant. Please do not use toothpaste as some toothpastes can be too abrasive. There are commercial mask cleaning products like McNett Sea Buff, but any good baby shampoo will work well. The benefit of using baby shampoo is that if you leave any residue when rinsing off, it won't cause major problems with your eyes while later diving or snorkelling. Rub the cleanser into the lens and skirt with your fingers several times and then rinse clean thoroughly with warm (not hot) clean fresh water. We suggest you do this cleaning at least twice. In the dive shop we usually tell people to do it three times in the hope they'll at least do it twice. If you're going to keep your mask in the plastic storage box it came in, we suggest you also clean the inside of the storage box and lid the same way to remove the thin film on them as well. Mask fogging is a normal occurrence, even after the film of silicone and release agents has been removed. Normal fogging can be easily prevented with after market anti-fog agents, saliva, or baby shampoo. Rub onto the lens and then rinse. Your dive mask should now be fog free! If it's not, you'll need to go back and clean your diving mask again as described above. 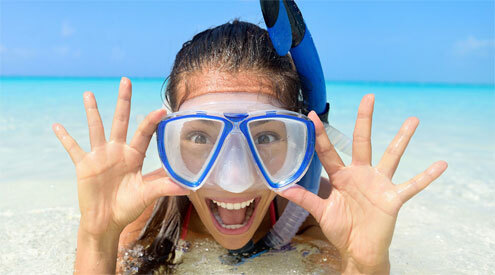 Masks should be treated with a defogging agent before every dive or snorkel. If treatment with a defogging agent does not prevent the mask from fogging, it is possible that some residue is left over from the manufacturing process, or that you didn't properly clean the mask after your last diving or snorkelling outing. If so, you'll need to repeat the cleaning process described above. Commercial Defog Products – coat the lens with an inhibitor like McNett Sea Gold, and McNett Sea Drops. Spit – For some, this is downright disgusting but it actually works. Saliva makes for an okay surfactant. It's easy and cheap. Baby Shampoo – Apply it neat onto the inside of the mask lens when the mask is dry and then put it away for storage. Then just give it a quick rinse before you dive. Start with a clean mask – The mask lens needs to be very clean so fog doesn't form. (Have we mentioned that enough times already?) Every once in a while it doesn't hurt to also clean the outside of the mask lens. It won't help to prevent fogging but you'll see better if the lens is clean on both sides! Commercial Defog Products — Surfactants like McNett Sea Gold, and McNett Sea Drops can be used. Both approaches work equally well but require different application methods so it's mostly a matter of personal preference. The liquid drops are a concentrated version of the spray type cleaners. Wet the lens first, add a drop in each lens, rub and rinse completely to remove. Spit – While we should be trying to sell you the 'you beaut' commercial solutions, our preferred pre-dive anti-fog is spit. Spit on the inside of the mask and rub it around with your finger. Dunk the mask briefly in either fresh or sea water. The goal is to leave thin layer of saliva on the inside of the glass. Spitting does not work well if the mask dries out before diving or snorkelling, so use this technique immediately before entering the water. Caution: – Under no circumstances should you spit in a diving/snorkelling mask and then rinse it in the rinse bucket of a dive boat! This is an almost certain way to spread viruses! The rinse bucket on a charter dive boat should be reserved exclusively for those using commercial defog, or the dive boat's preferred defog solutions. All it takes is one sick person spitting in a mask and briefly dunking it in the rinse bucket to contaminate the bucket. We avoid this by rinsing our masks in seawater (works fine), fresh water from the shower hose if there is one, or even bottled water as a last resort. Baby Shampoo – Another do it yourself pre-dive solution is baby shampoo. Baby shampoo can be used just like commercial defogging solutions. Many divers carry a bottle of 50/50 watered-down baby shampoo with their dive gear. A few drops rubbed into the lens and then briefly rinsed out just before the dive will keep a mask from fogging. We know people who prefer to apply baby shampoo neat onto the inside of the mask lens when the mask is dry just before putting it away for storage. Then you just give it a quick rinse before you dive. Baby shampoo is preferable to standard shampoo, as it is generally hypo-allergenic, less irritating to eyes, and biodegradable. Baby shampoo usually smells good, too. Still having problems keeping your mask unfogged? Then exhale through your mouth only. If you breathe out through your nose, warm moist air comes into contact with the colder mask lens. This results in fogging. We are all primarily nose breathers and some divers find not exhaling through their nose difficult. Often divers who complain about their mask always fogging up are nose breathing. Soak in warm fresh water, not over 49°C (120°F), to dissolve salt crystals. Store separated from other dive gear as the black pigmentation of other equipment may discolour the clear silicone skirt of your mask. For a large range of Masks for all conditions visit the Masks section in the The Scuba Doctor Dive Shop. There you'll find a wide range of mask types, plus mask accessories. If you have any specific enquiry about how to care for your dive gear, please feel free to contact Scuba Doctor Service and Repairs by email to scubadoc@scubadoctor.com.au or by a telephone call to 03 5985 5440.